Odontoglossum crocidipterum is a cool growing species native to wet montane forests above 2200m from Venezuela to Peru where it grows as an epiphyte in evergreen trees. The short sprays produce relatively large flowers and a well grown bulb will usually produce two spikes with up to six flowers on each spike. This plant is a recent devision but these flowers from a small bulb shows the floriferous nature of the species. For us the plant does best in well watered baskets which become mossy with time. 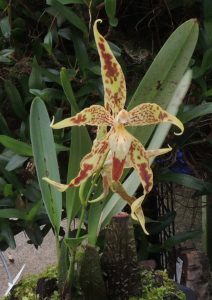 In common with all Odontoglossums this species has recently been moved to the genus Oncidium.